This is totally raw, vegan, wheat free, gluten free, and processed sugar free. A winner all round! And if you only use organic ingredients, then it'll be organic too! 1. Rinse and drain the soaked cashews. Soak the medjool dates in warm water. Line the bottom of an 8” spring form tin with baking paper. 2. Make the base by blitzing the almonds, desiccated coconut, vanilla and sea salt in a food processor until it has a crumb like texture. Add the drained dates one by one and blitz until combined. The mixture should hold together when pressing it between your fingers. 3. Press the crust mixture into the bottom of your prepared spring form tin evenly. Refrigerate while you make the filling. 4. In a high speed blender mix cashews, coconut flesh, coconut syrup, coconut water, vanilla, lemon juice, coconut oil and sea salt until it has a super smooth consistency. You may need to stop & scrape down the sides a few times & this may take a few minutes depending on the speed of your blender! If you find it is too thick to blend, add a little more coconut water to help facilitate. 5. Pour 2 cups of the coconut filling mixture into a measuring jug. 6. Now add the mangoes and turmeric to the remaining mixture in the blender. Blend until smooth. 7. Retrieve your base from the fridge. 8. Using a dessert spoon, alternate putting a spoonful of each mixture onto the base. So a blob of mango, a blob of coconut, a blob of mango, a blob of coconut, and so on until all the mixture is used up. This will give a slight marbled effect. 9. Smooth over the top of the cheesecake and place in the freezer for at least 6 hours to set. 10. Once it has set, gently remove the spring form tin, decorate with shredded coconut and mango slices and serve! Check out all them treaties!! 2. 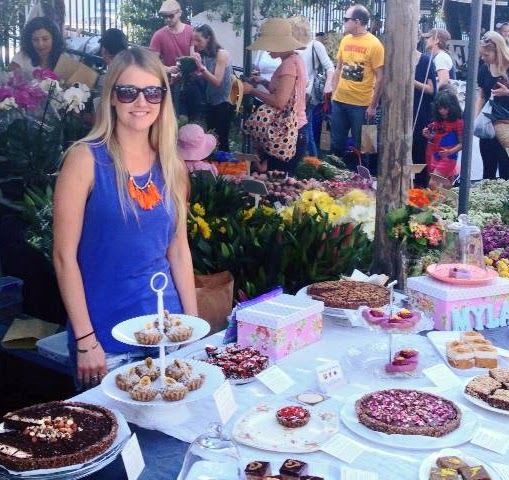 In the comments below, get creative and tell me what one amazing raw creation you hope Jade sells at her market stall. The most creative winner might just see their creation there one day! The winner of this tantalising gift voucher will be announced in the newsletter this Friday so sign up here to find out of you're the winner! Hmmm...I'm not sure what Jade is doing already at her stall but how about some delicious cherry creation?! Or perhaps a stone fruit raw slice creation...all fruits that are in season for Christmas! Or even a papaya & lime zingy thing...! Id drive to bondi if there were RAW apple pie. ..yummy! I've never seen a raw lemon meringue pie - but when you think about it - it may be possible? I'm gonna make this cake for xmas! Can't wait!